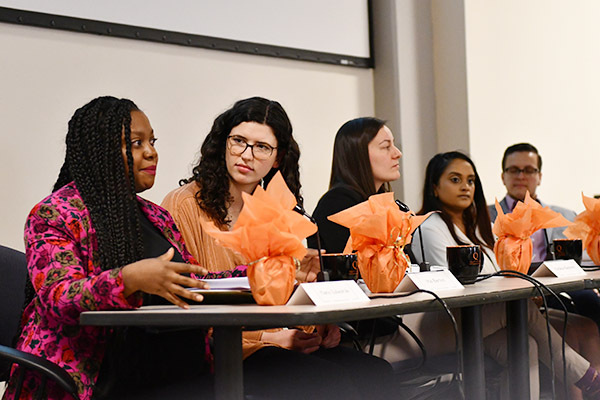 Tianna Edwards speaks during the Tri-Awards round-table discussion that included, from second left, Mia Berloni, Kandice Baptiste, Nirosha Balakumar and Lee Airton. This year's recipient of the Queen’s Human Rights Initiative Award is Alana Butler, a professor in the Faculty of Education who was instrumental in establishing the Teacher Candidates of Colour group. Adrian Baranchuk, a cardiology professor in the Faculty of Health Sciences, speaks after receiving the Employment Equity Award from Principal Daniel Woolf. Members of the Queen's community fill Room 202 in Robert Sutherland Hall for the Tri-Awards and round-table discussion. Llynwen Osborne (Physical Plant Services) speaks after receiving the Steve Cutway Accessibility Award, while Sue Lethbridge signs her comments. There are many people and groups at Queen’s working toward making the university a more welcoming and inclusive place. Four of these Queen’s community members were recognized on March 19 as the annual Tri-Awards were handed out by the Human Rights and Equity Office. This year’s celebration event also featured a round-table discussion, moderated by Stephanie Simpson, Associate Vice-Principal Human Rights, Equity and Inclusion, that brought together community members to discuss the future of higher education and Queen’s University in particular, through the lens of diversity, inclusion and equity. Each of the discussion members – Nirosha Balakumar, Kandice Baptiste, Mia Berloni, Tianna Edwards, and Lee Airton – have contributed to the Together We Are blog over the past year, and provided a different view from their own perspective and experiences. Presented by Principal Daniel Woolf, the Tri-Awards are given out to individuals and groups that contribute to the advancement of equity, human rights, accessibility and inclusion within the Queen’s community. The Queen’s Employment Equity Award recognizes and celebrates the achievements of individuals, groups or organizations that go above and beyond legislated requirements, thereby helping Queen’s become a truly representative and inclusive workplace. Through academic publications and advocacy efforts, Dr. Baranchuk is raising awareness and initiating dialogue to promote gender equality and female representation within cardiology and the broader field of medicine. He is passionate about providing mentorship and guidance to female trainees, helping them navigate the traditionally male-dominated specialty of cardiology. Dr. Baranchuk’s ongoing efforts will surely elevate Queens’ presence as a principle figure on gender equality in medicine. Dr. McKittrick was the driving force behind the development of a Queen’s National Scholar opportunity in Black Geographies taking Queen’s one step closer in diversifying its faculty and attracting new students from various backgrounds. Having this QNS position not only marks significant progress towards the university’s goals of creating an inclusive and representative environment, but will also provide years of support for studies in this area and strengthen the Black community at Queen’s and in Kingston. The Steve Cutway Accessibility Award recognizes outstanding contributions by faculty, staff and students towards advancing accessibility for persons with disabilities at Queen’s University. Llynwen Osborne has shown a commitment to accessibility by initiating a program within Physical Plant Services to educate colleagues and employees on Deaf culture. This new level of interaction creates a more positive, inclusive and enriched working experience, especially for the deaf community within PPS. Providing this opportunity not only improves the quality of life of staff, but also creates a potential for greater equality of opportunity at the university. The Queen’s Human Rights Initiative Award recognizes initiatives that have made an outstanding contribution to the advancement of equality and human rights at Queen’s University.